>Red Factor Canaries a Joy to keep with their Cheery songs. and a joy to red factor canary owners. Like parakeets, red factor canaries are mostly seed eaters. in order to maintain their reddish color. keeping two females does not usually present any problems. shades of brown, white, red, and orange. 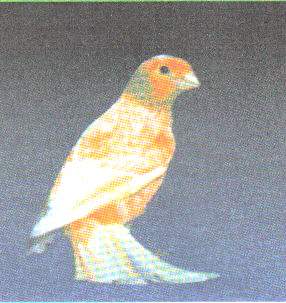 Red Factor Canaries come from breeding of canaries with Red Siskins. remain in their cages most of the time. Minimum cage size is 12"W x 12"L x 15"H.
seeds, be sure to check the food daily and remove empty seed hulls. A cuttle bone should be in your red factor canary's cage at all times. Canaries should always have access to clean, fresh water. Not tap water....use Steam Distilled water. The most famous canary is Tweety Bird of Looney Tune fame.